The Instagram Giveaway app enables you to import all the comments on an Instagram post and run a pick-a-winner contest for all the users who comment. You'll then be able to publish the winners on a customized page, and display a Certificate of Validity to show that your Instagram giveaway is transparent and trustworthy. The first Instagram comments giveaway is free. From the second giveaway onward it is necessary to purchase a Basic plan or higher. Check our comparative table of prices to know all the details of the prices and the characteristics of the plans for the Instagram comments sweepstakes. Following the recent changes applied to the Instagram API on April 4, 2018, the "Instagram Comments Giveaway" application is only available for business Instagram accounts. It is not available for personal profiles. You can read the notification sent by Instagram, and see the changes that affect our platform in detail, in this article. The "Instagram Giveaway" application is available for any Instagram post, photo or video. It's not available for Instagram Stories yet. The first step is to publish a post announcing the contest on Instagram. Write and publish it just as you would with any other post. Access the Easypromos Control Panel from this link. If you're not an Easypromos user, create an account and sign in to the control panel to create and manage your promotions. A) Your account information is located in the top right of the window. Use your account ID (preceded by the # symbol) to identify yourself when requesting help from the Support Center. B) This is the area where your promotions will be listed according to their status: Active Promotions, Draft Promotions, and Old Promotions. The next important step is to select the Instagram post that you've just published. Note: Business profiles use the new Facebook API for Instagram to import all the comments on the posts. 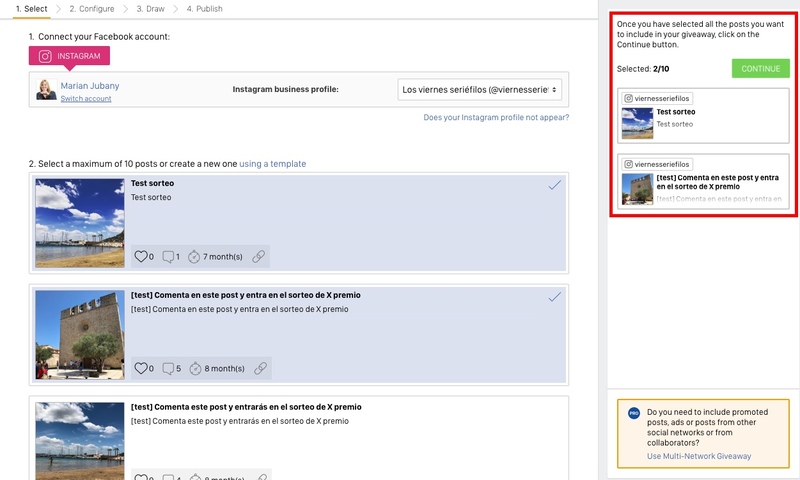 It's necessary to accept the Facebook permissions that authorize Easypromos to read the posts and comments on an Instagram profile. More information. Note: The possibility of selecting more than one post for the same giveaway is not available for the first free giveaway. Accounts with the Basic plan have the possibility of selecting a maximum of 10 posts for the same giveaway. In addition, with the "Multi-Network Giveaway" application you can accumulate up to a maximum of 25 tweets for the same giveaway. 9. By clicking on the "Continue" button, the import of the comments of the posts we have selected will begin. Have you promoted the post with advertising? When you promote an Instagram post, the Facebook Ads manager duplicates that post (as if it were a 'dark post') and spreads it to the audience that you've defined for the ad. That is, there are actually two independent posts: the post published on your Instagram business profile, and the duplicate post created for advertising. So when you're collecting comments for an Instagram giveaway, if some of the comments are linked to a promoted post, you'll need to include the duplicate post that Facebook Ads created. Adding the duplicate post to your giveaway means we can collect all the comments, from both the original post and the advertising duplicate. In order to add the promoted post to the sweepstakes you must use the "Multi-network giveaway" app, which will allow you, once you have imported the original post, to use the option "Add promoted post" to find the duplicate post and add all the comments linked to the advertising duplicate. Note: The "Multi-network giveaway" app is available for accounts with a BASIC PRO plan (49€ / $49USD per month) or higher. Learn step by step how to add a promoted post to the sweepstakes. 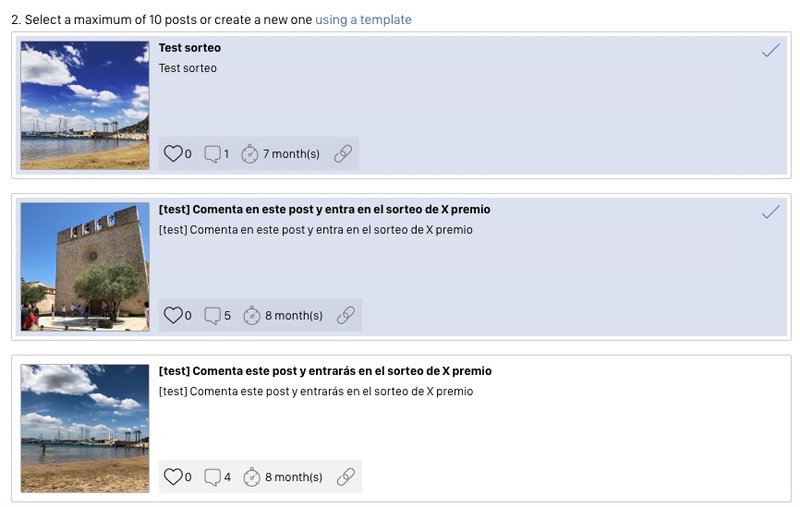 If you imported the sweepstakes publication to your dashboard days ago, the new comments that the users have left in the publication will not be automatically imported into your dashboard. In order for these new comments to be counted, you must update the list of participants as a step prior to finalizing the draw. 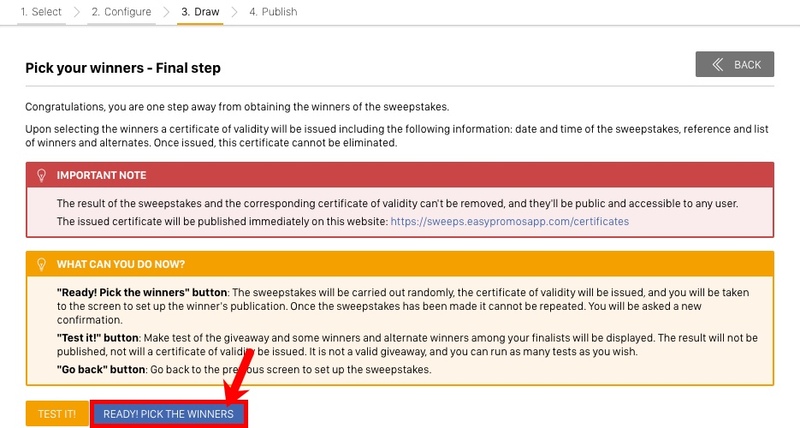 To do this, before advancing to the next step and finalizing the draw, click on the "Update now" button that you will find right next to the number of participants in your sweepstakes. When you click the button, you will see that the system will import all the new comments that the users have left in the Instagram publication and will add them as participants of the sweepstakes. You're on the giveaway page. Beneath the title you'll find the number of participants and options for viewing their data. In this section, you'll also find various tools for filtering and excluding users from entering the giveaway. 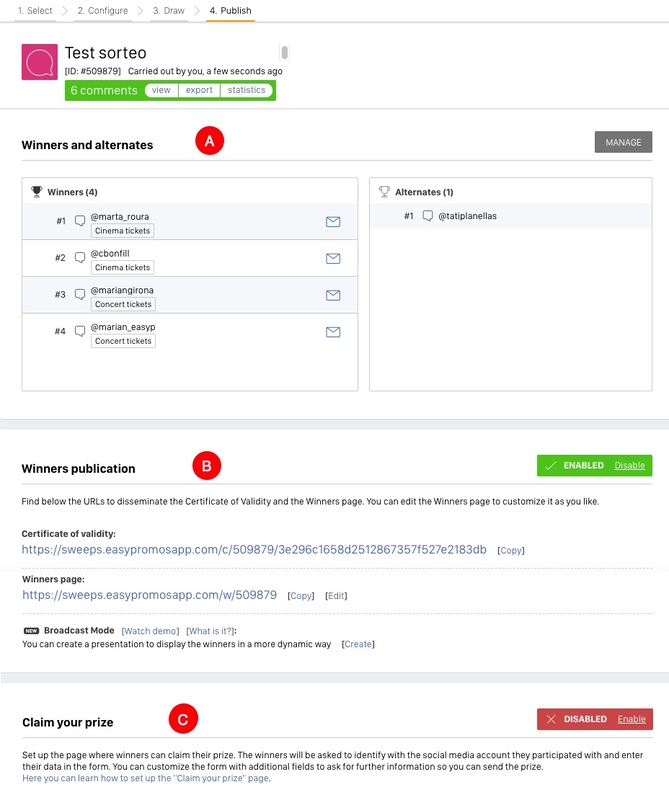 Requiring users to include up to five mentions in a comment, in order to enter the giveaway. Filtering the finalists according to the hashtags they use in their comments. Discover all the options for filtering and excluding users available in your Instagram sweepstakes. Next, indicate how many winners and alternate winners you need. 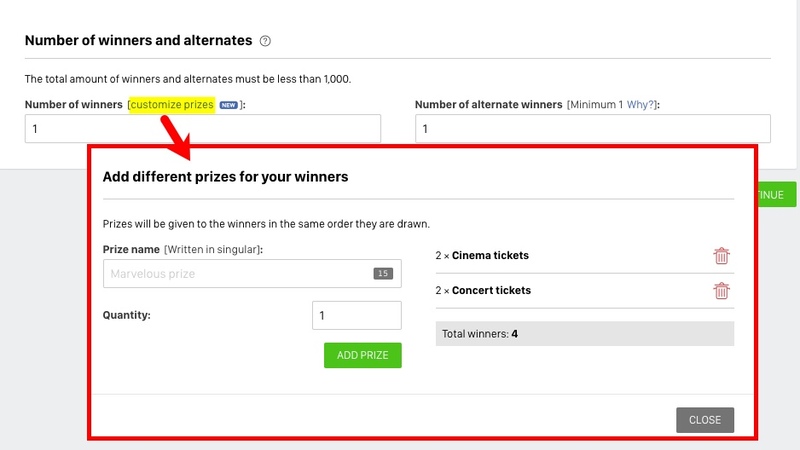 We recommend always requesting alternate winners, because it makes awarding the prizes easier and more efficient. Click "Continue" and you'll be taken to the Test Page. Here you'll be able to carry out a test to see how the giveaway will work, and how the winners will be displayed. With the option "Customize the prizes" you can create all the prizes you want to give away, and for each prize, you can define the number of winners you want to obtain. For example, you can have a first prize to give away some movie tickets with 2 winners, and a second prize of tickets for a concert with 2 other winners. Being two different prizes, this option will allow you to manage the number of winners you want to obtain for each type of prize, and at the time of publishing the winners, these will also be presented separately. Before you run the random giveaway, you have the chance to carry out a number of tests to see how the tool works and check it's functioning properly. Note: The test feature is not available in the "free first promotion" offer. When you are ready to pick a winner, the system will allow you to finalize the giveaway and see the winners and alternates. If you don’t have an active Basic plan, the system will offer you the chance to purchase it. Once you have an active Basic plan, and you're ready to pick your winners, click the "Ready! Pick the winners” button and winners will be picked randomly. Once the giveaway has been finalized, it can’t be repeated. Finally, a window will open with a summary of the configuration of your giveaway, which you must confirm in order to continue with the process. In addition, you have the possibility to activate the option "View the random draw as an animated presentation", which will allow you to visualise the process of selection of winners and alternates in the form of an animated presentation, more visual and graphic. See an example. Here you'll see the list of winners and alternates. You can manage the prize winners from this page, and change them if needed. Certificate of Validity. 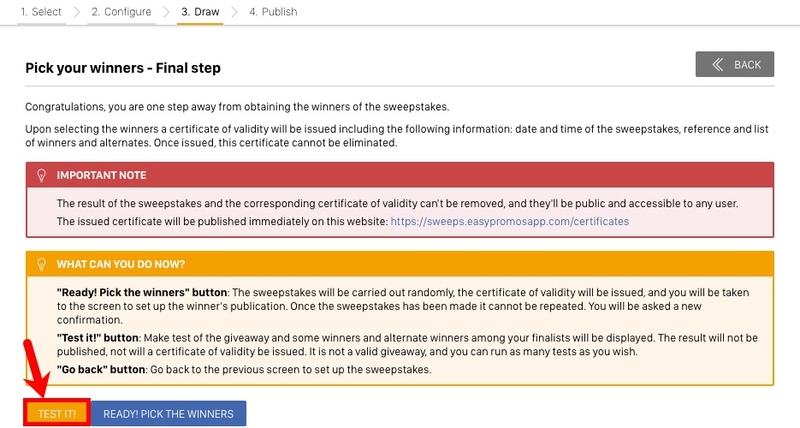 The Certificate of Validity confirms that the sweepstakes has been run once only and completely at random. This certificate identifies the sweepstakes and it can't be modified. 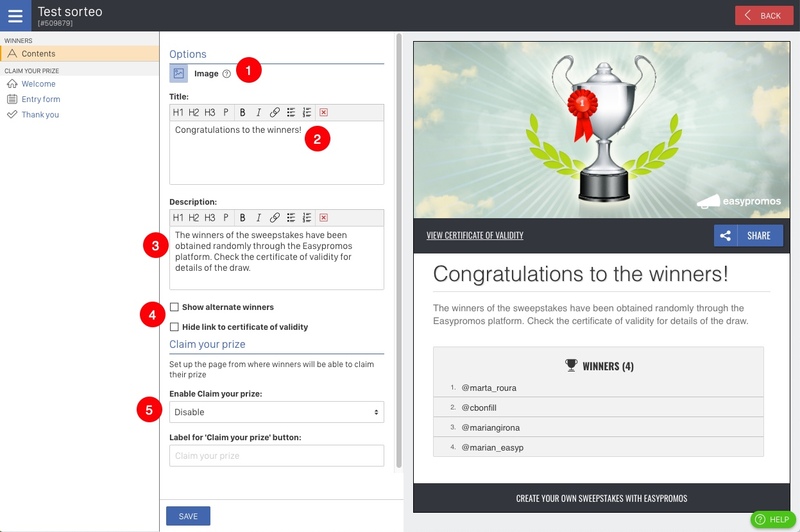 Share the URL with winners so that participants can see that your sweepstakes was run fairly and transparently. Winners Page. This is a microsite where the names of the winners and the alternate winners are displayed. This way, communicating the results will be easier. You'll be able to customize this page to adapt it to your brand and needs. Broadcast mode. This option allows you to present the results of a giveaway in an animated format to show the winners in a more fun way and add a point of surprise and fun to your draws. This option is only available with the Basic PRO plan or higher. Do you want the winners to be able to confirm their details and claim their prize? You can set up and activate this section to aid in the prize-awarding process. This way, users who visit the Winners Page will be able to claim the prize on their screens, verifying their details and confirming that they're interested in receiving their reward. Publish a link to the Winners Page in the Bio of the organizing brand's Instagram account. Publish a post or a story where the results of the giveaway are announced, so that viewers can find the link in the Bio. Use your social media channels to share the link to the Winners Page. Keep in mind that links in Instagram comments and photo descriptions are not active, and can't be clicked on. Manage the prizewinners and change them if necessary. Here is the best tool to select random comment, like or author from your Instagram post. Additionally you can get follow status check and like status check. Works for Youtube videos too!